India produces about 1.43 lakh tonnes of solid waste every day. Does this give you an alarming image of the kind of waste that gathers in landfills on daily basis? Indian cities already lack the dumping spaces and the day is not very far when we would run out of the space to dump garbage. Under the Swachh Bharat Mission (SBM), the government aims to attain 100% scientific management of the solid waste. On an average, only between 23-35 percent of solid waste gets processed. It’s a grave situation and understanding the severity of the same, Cello, an Indian household brand has taken up the Kleenothon Initiative. With waste management being the need of the hour for the country, Kleenothon harps on the importance of segregating waste at source. When waste is segregated at source, disposing waste becomes easy. The sorted waste is easy to recycle and thus, less waste will end up in landfills. So, in a nutshell, dealing with waste the right way can make a big difference. 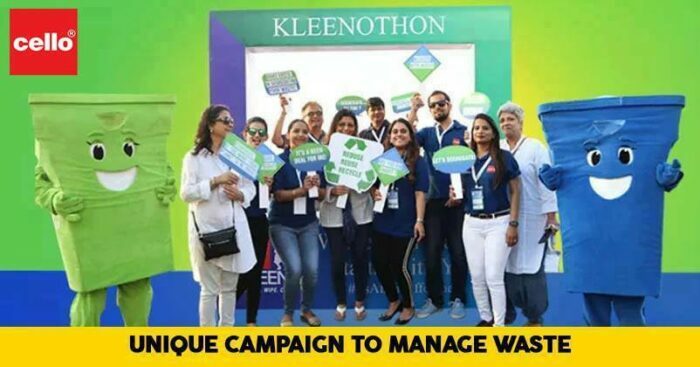 Cello’s Kleenothon encourages people to make use of separate bins for disposing their waste- green bin for wet waste and blue bin for dry waste and aims towards achieving a Clean India. The 2-day Cello ‘Kleenothon’ was held in the city on 18th and 21st January 2019. Cello launched its Kleeno Mascots to sensitize people to ‘Segregate Waste at Source’. The event consisted of a street play and a day full of fun interactive games and activities that encouraged people to sort waste at source. The occasions were graced by the Marketing Director of Cello, Mrs. Sneha Rathod Ajmera, Harshita Narvekar – Corporator Cuffe Parade along with BMC, Rotaract and the Nariman Point Association delegates. The events were conducted under the National Volunteering Weeks activities of the CII India@75 in association with the governments Swachh Bharat Mission initiative. Kleenothon ended on a successful note and gave an important message, ‘Waste Segregation Starts With You’- #ItsABinDifference.